I wonder if they knew that..
Also got some flowers and appropriate teacher ornaments.. This adorable jewelry holder and those even cuter skull earrings..
And a new Stella & Dot wrap bracelet. Boy do those kids know me well. Funny how you learn the most from people you don't expect to. My little grade ones have taught me so much this school year, sometimes I feel like they're the teachers instead of myself. My last day with them tomorrow, all I have planned is time where we can play building blocks and colour and run around outside and read stories together, time spent in the best way possible in the best company. It's 9:3o and still light out. Time for patios and barbeques and vacations and little dresses. A friend gave me this floral one at the end of last summer, it has been waiting a whole year to be worn. And recently bought this printed one in an XL, it was all they had, but a few stitches later and it fits perfectly. Two weeks and I'm headed out east. I just. can't. wait. I like easy outfits, ones that don't take a lot of brain power to decide. The big sweater might just be your best friend this summer if you want some no-fuss ensembles. It's got a cabin-fever/camping-throwover kinda feel going on, but could easily be tossed over a swimsuit after a day at the beach for an outfit all its own. Voici three different looks with the big sweater: paired with shorts for a simple look, layered over a maxi dress with boots for a cozy evening around the campfire, and by itself with red heels for a night out. Crazy time of year. End of school, report cards due, planning for next year's new job, two more runs in a week, packing for my month-long trip, hockey playoffs... Plus, I have been sick sick sick. I get stressed and inevitably my body decides to shut down. The only thing keeping me sane is weaving friendship bracelets, been working on them every night. Which seems sort of applicable right now, seeing as Vancouver - despite all the madness that has recently gone down - exudes a calm, strong friendship among those who know what this city, really, is all about. Congratulations to the Vancouver Canucks, who came so far and made us proud! If you have any information on last night's events, you can let VPD know here. Just have to share what happened in class today with my grade ones. My kids write almost every day (writing and reading are a big deal in grade one), usually about a story they've just read. One student came to me with her entry: "All the dacks were at the pond. Mama dack and Dad dack and baby dack, met all the other dacks. Mama dack and baby dack got food, and went back to Dad dack. Mama dack and baby dack were eating their food with the other dacks." I read this back to her, to see if she'd catch her mistake. Ended up with us laughing hysterically, along with the rest of the students who were listening in. The remainder of the day resulted in "dack" jokes. Sounded to me like they all had funny Southern accents. Awesome. Canucks are in the playoffs, there is a game every other night, but I just can't bring myself to wear a jersey each time we play. I think it goes against my fashion rule to not wear the same thing every day (sorry Vancouver..). But, if you're like me - a true fan at heart and never a bandwagoner - then you have to have another option to show your support other than donning a team uniform. Fortunate are we to have blue and green as our colors (imagine having black and orange for Philly, or teal for San Jose?). They totally work together, in whatever shades you find. In fact, it's better to mix your shades, monochromatic outfits are sooo in right now. Not a fan of face painting? Mac's eye shadow in Freshwater is the perfect shade of electric blue to accent your look. 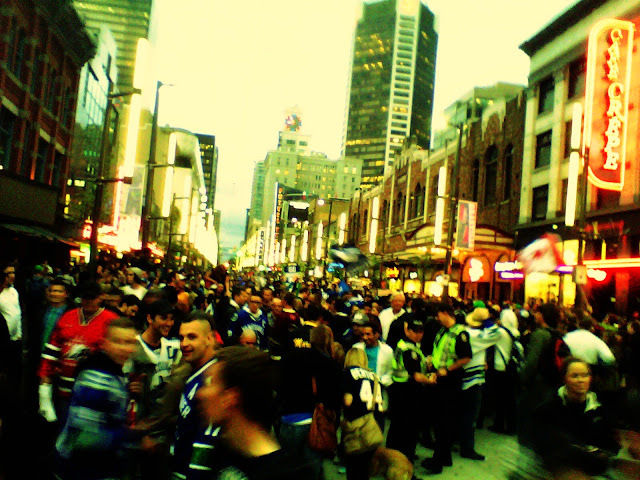 Add a few bits of tasteful Canucks paraphernalia, like Johnny Canuck and Linden's #16..
After the game tonight, a few guys decided to chirp me on the corner. "Nice blue shoes gurl," "No man, they're magenta," "Nice magenta shoes gurl. Where you goin magenta shoes?" "Looks like magenta shoes is ignoring us boys. Now magenta shoes is walkin away boys." Leçon pour des garçons: get your colours right if you're gonna yap at me! Just less than a month til I head out east for the summer. Need to get out of the habit of buying things for my trip and instead save to buy things while on my trip. Picked up these shorts and longsleeves this weekend and have been wearing the same thing over and over, they're just so comfy. With all this running around enjoying the sunshine, getting home from work in time to watch 5pm games, and then jumping around afterwards in such childlike, uninhibited excitement, casual outfits seem necessary. 2 down, 2 to go Canucks.